For far too many today, life is being lived in a valley of dry bones, very dry bones. A career that once held great promise has careened out of control because of addiction. A marriage that started in a magical world has ended up in a world of misery because of self-centeredness. A ministry of service that began building a monument to the glory of God has come crashing down in the ruins of everything a man once stood for. Countless careers, marriages, and ministries have become nothing more than a valley of dry bones, very dry bones. The prophet Ezekiel gives us a wonderful word of comfort and encouragement . . . no matter what circumstance we find ourselves in today. 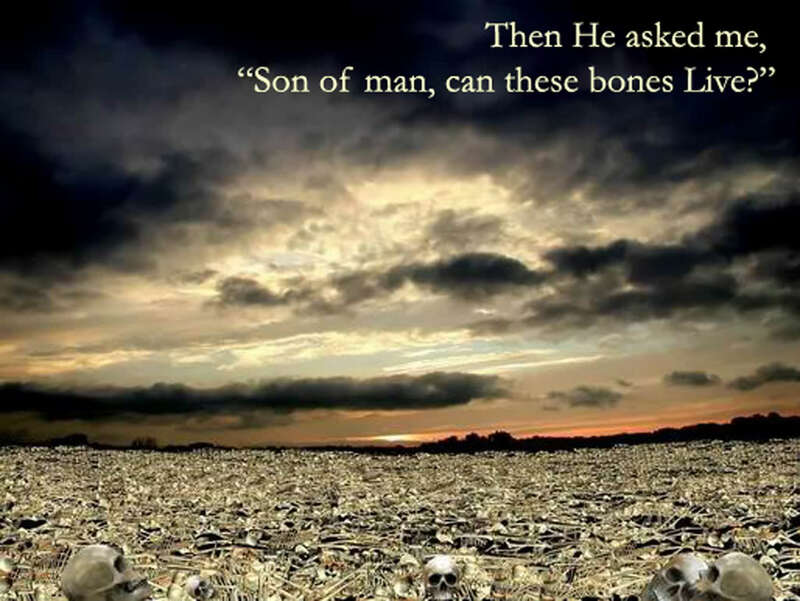 You see that the first vision given to the prophet was not a pretty sight “I saw a great many bones on the floor of the valley.” Dry, dead bones were scattered everywhere. Notice the second vision: “The bones came together, bone to bone.” As of yet, however, there was no breath in them. Imagine what was running through the mind of the prophet when he heard the rattling sound of those dead dry bones coming together, attached by tendons, and being covered by flesh and skin! But the vision did not stop there, because in spite of the miracle of putting the bodies back together again, there was still no life. So God took Ezekiel deeper in to his vision. God told him to prophesy and breath will enter them. Guess what? It did! From his first vision of being surrounded by nothing but dead, dry bones, the prophet now found himself standing in the midst of “a vast army” that God assembled right before his eyes. Funny thing about God: He seems to enjoy bringing life out of death. He brought life to dead Adam with a breath in his nostrils. He brought life to these dead dry bones. He brought life to Lazarus in the tomb. He brought life to Peter after his denial of the Lord by giving to him a new vision of feeding God’s people. He brought life to Saul on the road to Damascus—Saul, who was dead in his trespasses and sins—and turned him into the apostle Paul. And God can bring life to you and anything you are facing today that is either on “life-support” or already dead. You have His Word on it! “I am the way and the truth and the life,” He tells us (John 14:6). Now you need only to catch His vision in whatever valley of dry bones you are facing today . . . and watch Him work!